Audio Technica to launch £2000 ATH-ADX5000 headphones at IFA 2017 | What Hi-Fi? The ADX5000 headphones are priced £2000, feature 58mm drivers and honeycomb housings, and will make their debut at IFA 2017 in Berlin. 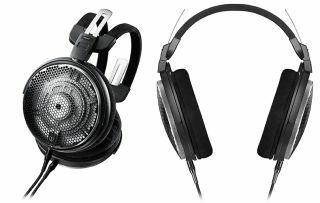 Audio Technica has a new pair of open-backed headphones ready to show off at this year's IFA exhibition. The ATH-ADX5000s are the latest in the company's 'Air Dynamic' range, but with a hefty price tag of £2000, they won't come cheap. Audio Technica has incorporated a few neat designs into the headphones, including a new core mount technology to enhance airflow efficiency, and an improved diaphragm response for better timing. Connecting the headphones to your audio system is a 6N-OFC oxygen-free copper cable and a 6.3mm jack. The headphones' 58mm drivers are housed in a honeycomb punched case, which Audio Technica claims will reduce air pressure loss and maintain a good tonal balance. The ATH-ADX5000s will be available in the UK from November, priced £2000. Audio Technica has also used IFA 2017 to unveil three new wireless in-ears. The ATH-CKR75BT (£150), ATH-CKR55BT (£90) and ATH-CKR35BT (£55) models, which are available from October, feature Bluetooth 4.1, with the former two supporting aptX and AAC codecs. The latter supports AAC only. All trio have a seven-hour battery life (charged via USB) and an in-line remote and mic.